The premier air purification package as a retro-fit! The Electro Breeze Duct Mount UV Kit was developed to meet the requirements of many of our allergy, asthma and multiple chemical sensitivity (mcs) customers. Many of them were in need of an upgrade to help rid them of mold, bacteria and viruses. 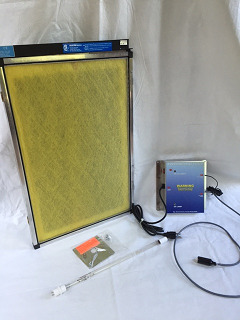 The Electro Breeze electronic air filter is capable of trapping and killing these particles, but their kill rate is extremely high when coupled with the effects of the Ultra-Violet germicidal kit. Click here to see the dramatic effects of the DMUV kit. What is the Electro Breeze DMUV kit?